What a week! Where did it go so quickly? In my final post I would like to chat a bit about my favorite technique for piecing, foundation paper piecing. I love how precise you can follow a pattern by sewing over the lines. I have to admit, I'm a kind of a lazy quilter. 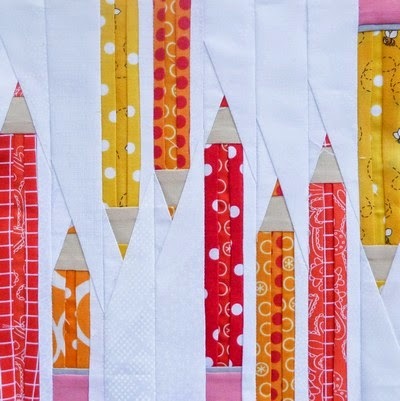 With paper piecing, you don't have to measure every piece of fabric, as long as fits, it sits. How wonderful. So the cutting process if quite fast, the sewing is easy (just follow the lines) and the result is very crisp and precise. Just love it! The things you need for foundation paper piecing are: fabric, paper piecing paper, scissors, a ruler a sewing machine (or just needle and thread) and of course a nice pattern. There is paper piecing paper that you can put in your printer, to save time tracing all the patterns. I like the 'fun-dation' paper to work on. Or just normal (brand-less) 'theezakjespapier' as we call it, the paper used to make tea bags. It is a bit transparent and you can easily rip it away after sewing. The transparency helps me to put the pieces of fabric in place, since the fabric is on the other side of where you're sewing. One tool that I use a lot while paper piecing is the 'Add a quarter' ruler. It's the yellow ruler, also used in above tutorials. You use it to add a quarter inch from your reference line. First I worked without it, that also possible, but it makes the process to much easier. (And faster, haha I told you I'm a bit lazy didn't I?) The fact that I work with centimeters in stead of inches is not a problem at all. The only think I don't really like about paper piecing is removing the paper. With a big project it can take a while before all the tiny pieces are gone. There is paper available which you can leave on, but it does make your quilt a bit stiff. What helps making the ripping easier is using a smaller stitch length while sewing. The more holes in the paper, the easier it will rip. 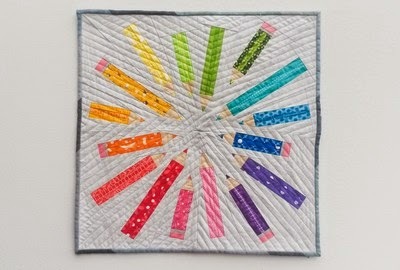 It was so nice to read all the lovely comments on the pencil quilt block on Instagram, thank you so much! I decided to turn the pencil block into a pattern to put in my Etsy shop. 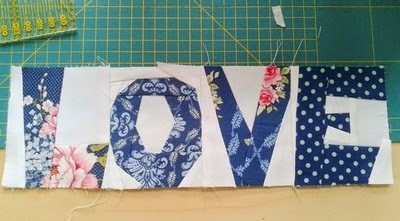 My very first quilt block created during my 52quilters week, how cool is that! As a thank to you all there is a 30% discount when using the code '52quilters' at sugaridoo.etsy.com, only until the end of april. This week had been so much fun! I can't believe it's already over. Thank you so much for the opportunity Chris, it was a wonderful experience. Good luck to all the 36 quilters that will follow! I enjoyed your time on 52 Quilters ~ that quilt you made for your Mom was so wonderful and thank you so much for making the pencil pattern available! I've got mine!